I have a very simple card to show you today. 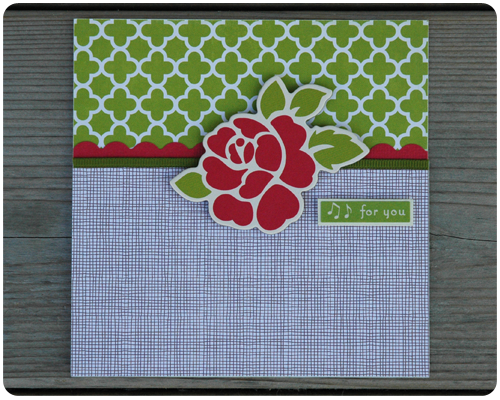 I love when paper from one company works perfectly with embellishments from another, especially since I often have mishmash of scraps laying around. 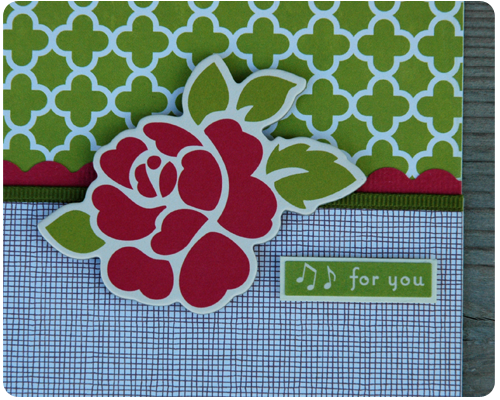 This was the case with this card - the paper is from Jillibean Soup and embellishments are from October Afternoon. I even used some ribbon on this card which I have not done for a while. Simple and pretty - just the way I like it. Simple and beautiful! Love the colors! Another fun idea and we love the colors too! Thank you Sharon and Denise. That is one beautiful card, the colors really pop and work together. This is a perfectly simple card and definitely one I would pick out in a store! Lanaya, thank you for your lovely comment, especially that you would pick out this card in a store - that means a lot to me.